Touching an all-time high, fuel prices continued to rise for the sixth consecutive day on Friday, with diesel crossing Rs 70 a litre mark for the first time ever on drop in rupee value. Domestic cooking gas (LPG) price was also hiked by Rs 1.49 per cylinder. The surge in fuel prices is largely due to the rise in the cost of crude oil and the high excise duty levied on the transportation of fuel in the country. London Brent crude oil has breached the $77 per barrel mark, while US West Texas Intermediate is nearly at the $70 level. 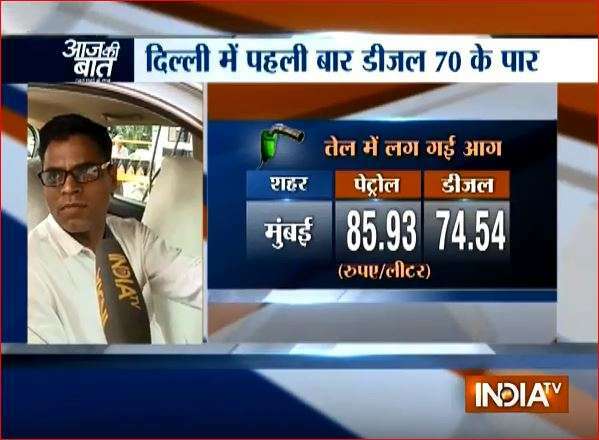 In Delhi, petrol is selling at a price of Rs. 78.52 per litre, implying a hike of 22 paise. In Mumbai, petrol is retailing at Rs 85.93 per litre, a hike of 21 paise from Thursday. Petrol is priced at Rs. 81.44 for one litre in Kolkata and Rs. 81.60 per litre in Chennai, data from IOC app showed. The revised rates are applicable from Friday 6 am. Diesel rates were hiked by 28 paisa a litre, the steepest increase since the daily revision in fuel rates was effected in mid-June last year. A litre of diesel now costs Rs 70.21 in Delhi, where the rates are the cheapest in all metros and most state capitals due to lower sales tax or VAT. Petrol price was increased to Rs 78.51 per litre from Rs 70.30. The balance Rs 29.01 (Rs 30.50 minus Rs 1.49) is being compensated to the customer by the increase in subsidy transfer to their bank account. Accordingly, the subsidy transfer in the customer's bank account has been increased to Rs 320.49 from Rs 291.48 in August and Rs 257.74 per cylinder in July.